VCSELs are emitting perpendicular to the wafer plane. Direct probing and fiber coupling is possible. 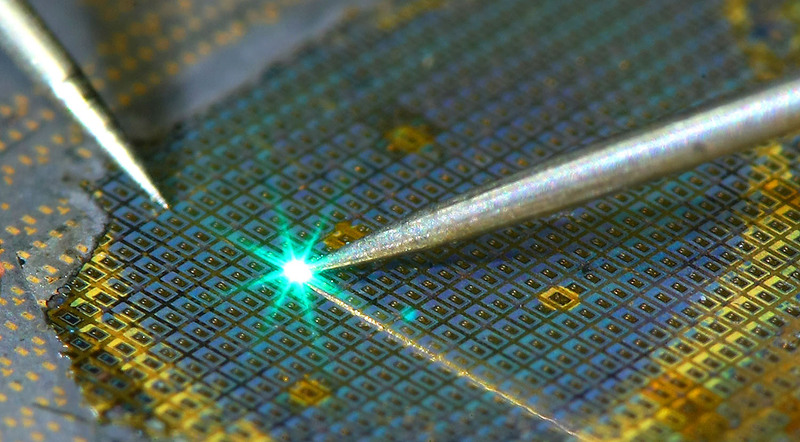 With very large numbers of VCSELs per wafer, fabrication costs are low. As device designs can be varied systematically by lithography, many different device concepts can be realzied in one research run. With our automated wafer prober, thousands of devices can be remotely characterized and statistically evaluated. The dynamic properties of VCSELs can be characterized by small-signal and large-signal experiments. The small-signal data can be modeled by quite simple linearized rate-equation physics and parasitic eqivalent circuits. These results give direct answers to questions concerning device physics. Large-signal experiments simulate a potential systems application. Successful results are a proof-of concept for application in optical data transmission systems. Higher coding efficiency is another degree of freedom to achieve higher data-rates at better energy-efficiency. High-Contrast Gratings (HCG) are nanophotonic metastructures allowing to miniaturize optical components such as Bragg mirrors. At the same time these very compact strucutres allow implementing additional functions such as mode filtering. These structures give another degree of freedom in device design, which can be utilized for further progress. To understand device physics and extract scientific answers from experimental data, advanced modelling is very important. Over simplified models both in structural nanophotonic device design or laser dynamics give only limited or misleading answers inhibiting scientific progress. Therefore, we adjust our models if required by our experimental findings. In collaboration with Prof. ZHANG Baoping (Chinese: 张保平) at Xiamen University we also work on visible VCSELs covering the Green Gap.